Mezzo-soprano Megan Moore hails from Cincinnati, OH. An Eastman School of Music Concerto Competition Winner, Megan has performed Berlioz’s Les nuits d’été at Kodak Hall with the Eastman School Symphony Orchestra. In a concert celebrating André Previn’s 85th birthday, Megan was chosen to be soloist with the Eastman Wind Ensemble in a special arrangement of Mr. Previn’s Vocalise. She was also featured as soloist in BWVs 80 and 179 in “Bach! A Cantata Series ” in Rochester, NY. 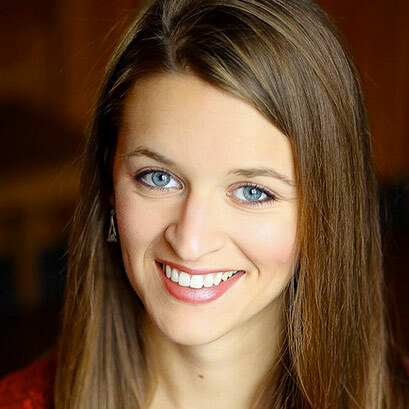 Megan has been featured as soprano soloist in choral works with Miami University Chamber Singers, Miami University’s A Grand Night for Singing, and Westwood Presbyterian Chancel Choir. Active as a singing actress, Megan sang the role of Blanche de la Force in Eastman Opera Theatre’s most recent production of Dialogues of the Carmelites. Other leading operatic roles include Mabel in Pirates of Penzance and the title role in Massenet’s Cinderella. Megan made her operatic debut singing La Suora Infermiera in Puccini’s Suor Angelica. Megan’s training and skills extend to musical theatre and dance. Musical theatre credits include Jo in Little Women, Hope in Anything Goes, and Belle in Beauty and the Beast. She is also no stranger to straight theatre, having performed the role of Mrs. Frank in The Diary of Anne Frank. Megan is a recent graduate of Eastman School of Music where she studied with acclaimed soprano and teacher Carol Webber. Megan received her Bachelor of Music degree from Miami University where she was chosen from among her peers to be the Presser Foundation Scholarship recipient for the class of 2012. She has received training abroad at the American Institute of Musical Studies in Graz, Austria, as well as La Musica Lirica in Novefeltria, Italy. A lover of song repertoire as well as new music, Megan participated in the 2011 SongFest festival where she worked in masterclass with acclaimed artists like Jake Heggie, Libby Larsen, and Martin Katz. Megan co-founded the Lynx Project, a new art song iniatiative giving its inaugural season in the spring of 2016.